Strideaway | » What Is A Derby? Without misquoting Tennyson and without attacking or impugning the motives, character, literacy or parentage of anyone living or dead, this writer would like to relieve himself of a burden of thought that has been abuilding for many months — several years, indeed. It is with great regret that this piece is offered without rib shaking anecdote or without circumlocutionary diatribe, but with the same sincerely ingenuous (not ingenious) interest with which Jonathan Swift offered his “A Modest Proposal” to a jaded empire once on a time…But it may be nevertheless entertaining. First of all, I would lead you through a remembrance or so. Whether it was at the age of seven (as in my case) or at the age of 27, all of us at one time or another were exposed to a bird dog for the first time. 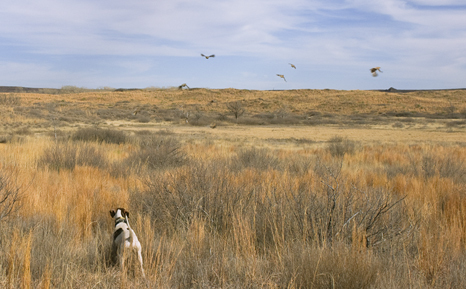 In order to understand the question posed by this piece, we must first of all and firmly establish this experience in our minds, and upon it build the rest of our experience with bird dogs. Hypothetically, let’s postulate that the first bird dog we saw was old Jake, with a knot on his nose and a hump on his head and a tendency to crouch the closer he got to game. He was broke to a farethee-well. How did he get that way? In succeeding years we found out. So let’s say that we broke some dogs. How long did it take? It varies with the dog, you say? Ah,yes, but at what age would you say that a dog — pointer or setter, now — would be ready to fulfill every mission you had attributed to his ability? At what age is a dog absolutely foolproof? We are talking about dogs now — hunting dogs. Now with the answers to these questions in mind, let’s settle down to the investigation of the institution known as the Derby stake. The effort here is to stir up thought, not controversy. It seems to me that a Derby should be a Derby within the age limits designated; however, this is not the purpose of this piece. It is the increasing pressure on the dogs entering their Derby year that is disturbing to me, and the consequent loss of great young dog flesh. No matter how anyone is able to re-direct the attention of the judiciary to potential, instead of explicit performance, the fact will remain that if one Derby knocks and chases a covey and another had clean work and Derby A then has a good find which is matched again by immaculate Derby B, and both have comparably excellent races, then Derby B will win. True, and I say that the Derby that runs like a Derby and has two finds without error has more potential that day than the one which runs comparably and makes an error. But, still, until the Derby championship competition begins in January, nowadays, more Derbies that point and handle birds flawlessly, and run nice, forward, limited patterns win Derby stakes than the ones which are exhaustive, vibrant, alive, fiery and unpolished. This encourages the whispers and sniggers about overage dogs in Derby stakes, unbreakable old mavericks in puppy stakes and a never-ending flow of winning Derbies which wilt away and are never heard from again. I don’t know when olden days began and stopped, but even I can remember when Derbies won Derby stakes. Then, alas, as I write I know all of this will come to little good because there is a hue-and-cry that there is no place to run big reaching field trial dogs anymore, and there is a great deal of thrashing around about this very real problem, and a shrill cry against any plan which involves the state (of Kansas or Massachusetts) providing small game or field trial areas. This fear is evident and vocal despite the fact that in many states the total outlay for outdoor recreation is equal to the amount it costs to pave twelve miles of two-lane blacktop highway! But that is another story. Here we are giving the name “Derby” to a stake in which, in many, many cases, the finesse of a champion is required to win. One classic example comes to mind, and I have seen it recurrent in many trials since — as a matter of fact, more recurrent. One of the very finest ground patterns I have ever seen was naturally run by a young male pointer from the time he got his legs. 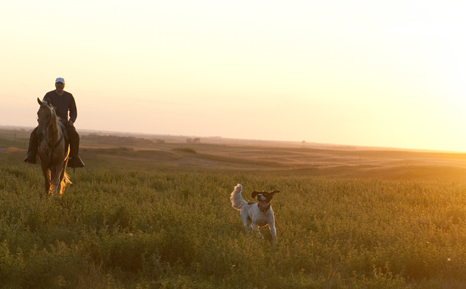 He added to this as a puppy by knocking all his handler’s chicken on the prairie, and then pointing some of them his second trip in his Derby year. He was such a strong bird dog that he continued to love and point his game, but he would pooosh ’em up; check-cording and soft, kind treatment would not deter him from the convulsive leap. I do not know what happened, but he got broke. 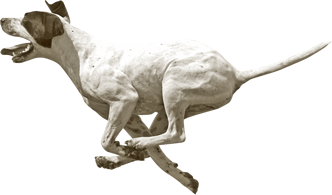 He would run as great a race as a Derby as any all age dog then competing on the circuit, but when he pointed, he ended up like a fried egg. Leave us not fuss about which dog it was. You’d never guess right anyway. Leave us not dwell on the handler, or the helpers, or their apparent mistake. This dog won a Derby back in the States, and he loved his game so much that he would not blink it (as many Derbies will do when you let the hammer down on them), but he would point it his way. Actually, we all knew even when he won that Derby that he would never win as an all-age dog. But it was the well known demand for all-age manners in a Derby that brought the men charged with developing this dog to take him just that much farther than he was ready to go, before he was ready to go there. 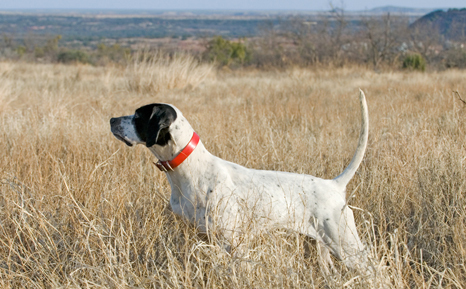 The clarion call is for a more unified approach to judging the young dog so that the Derbies may all have a natural development as bird dogs in the approach to tone all-age competition. I talked at length with many close friends —professional trainers all—before writing this. One said: “Look, Bill. Listen carefully …Many times the kind of Derby that you’re talking about —the kind that is not quite finished when it comes off the prairie— never is polished, never polishes, never breaks, is always an outlaw. What do you say about that? Should they win over a short running dog the same age that is finished on game? “Well,” I replied, “you are lucky, and I would say that he still was a good Derby with great potential and the only thing you can do is lament for the absence of the knowledge to harness his potential. Now, I must admit that this speech did not go over like a Mardi Gras parade with my friend, who is a master with Derbies, but think about it a minute. And, let’s go back to the shooting dog that Unk or Paw or Gramp had. He was a good bird-finder as a puppy. He pointed a lot the second season, and he was mauled around a lot and toward the end of the season he didn’t point as many birds as he flash pointed as a puppy, and we attributed this to the overshooting of the birds and someone encroaching on our coveys. At the start of the third season, Jake made some young mistakes and was corrected often and harshly, and by the end of that season we suddenly realized that the bird crop was bigger than we figured back before January. The next season, Jake was a brag dog and he continued to get better until he was run over or poisoned, or if you were as lucky as I was, until you finished high school, and he died of old age in the field in a November when you wanted to spend that November forever with him and never go back to college. Equate this old cold-blooded shooting dog. 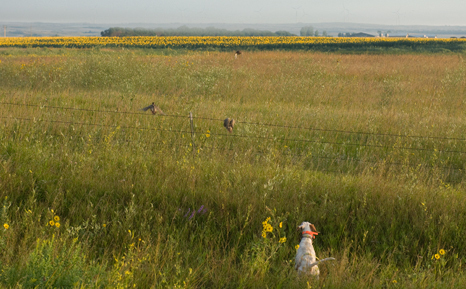 “L’histoire” with the development of a bird dog destined to compete in field trials, remembering that if we were looking for dogs like this there would be no trials to begin with, and no definition of “class” dogs. As a puppy he races around pell-mell and, if you please, willy-nilly, unless he is a whip-runner, and he chases quail and fairly screams around far away in every direction. Then, a magic moment comes, when he stops and flash points, and you will see that — especially after you have been able to kill him a bird — he will wait for you to get nearly there. He is becoming a Derby now and a check-cord is in order. 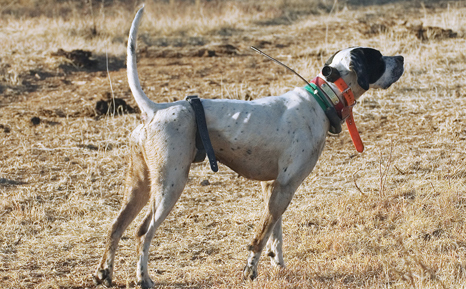 Depending on the use of the check-cord and collar, he will not — when you release him before a gallery — show anywhere near the amount of natural hunt, depending on the amount of time it has been necessary to spend bringing him to the front and showing him that’s where he is supposed to be. His bird score goes down, and depending on how much you let the hammer down on him, requiring him to stand for wing and shot, his natural application suffers, for he knows you want him to stay “clean” and remember that a dog’s first and only raison de’etre is to please man! Then, the next year, he begins to come out of it, and though his bird work is spotty (this is the so called “jinx” first all-age year) he has about twice as much as he had as a Derby. The next year, if your luck has been running good, his bird score trebles over his Derby season and you are ready to win with him in all-age stakes. The rest is apocryphal. Here, I am not writing about the exceptional dog, but about the average as I have seen them in field trials. I would not attempt to prove here by quoting dogs or wins. I would rather let Mister Ed Farrior, B. McCall, George Crangle or Ches Harris (none of whom I consulted about this) bear me out or not, as they choose. The less pressure placed on a dog during his formative Derby year, his true elastic adolescent period, the sooner and loftier can he become polished in his next and first mature year. In finality, it all depends on what we want — whether we really are in search of the class dog, or whether we want inhibited shooting dogs less than two years old — weak cornerstones for tomorrow’s field trial temples. Strideaway mascot, Fin, born and registered in August of 2004 shown here in January of 2006 being broke in Texas. This was her 7th find and the first where she allowed trainer Joe McCarl to flush her birds. 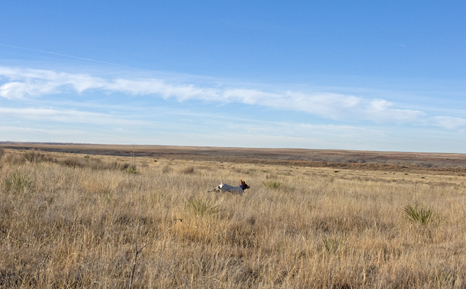 She placed in her first field trial — a wild bird derby stake — the previous September where she flash pointed a woodcock. The following winter in Texas, 2007…after a summer on the prairies. 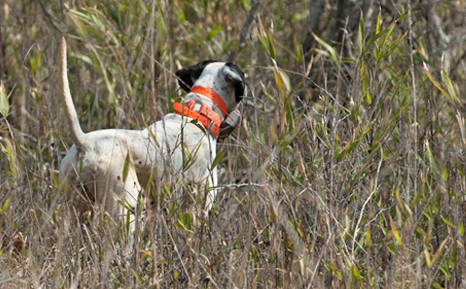 Shown here in Alabama in 2011, Fin flawlessly pointed 40 covies and singles during a three and a half hour quail hunt.